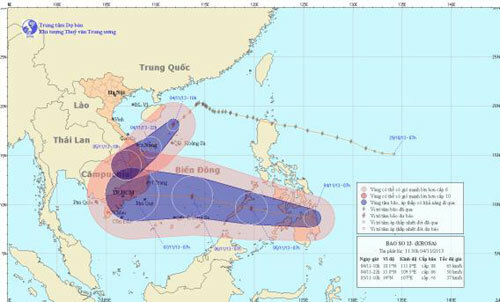 VietNamNet Bridge – The National Hydro Meteorological Forecasting Center on November 4 announced that Storm ‘Krosa’ has changed direction and may weaken into a tropical low pressure system on the East Sea. At 4am on November 4, the storm was centered 18.9 degrees latitude north and 112.9 degrees longitude east, about 240 kilometers north and northeast of Hoang Sa Archipelago with strong wind speeds of level 8-11. Within the next 12 hours, the storm will move west southwest at a speed of 25-30 kph and downgrade into a tropical low pressure system. By 4pm, the tropical low pressure system will be located 16.7 degrees latitude north and 109.9 degrees longitude east, about 180 kilometers northeast of the coastal region from Quang Tri to Quang Ngai provinces, packing strong winds with gusts up to level 8-9. Within the next 12 to 24 hours, the tropical low pressure system will continue to move west southwestwards at 30 kph then weaken into a low pressure zone before entering the mainland towards Thua Thien Hue and Quang Ngai provinces. By 4am on November 5, the low pressure zone will be located 14.6 degrees latitude north and 106.9 degrees longitude east, on the southern region of Laos, with maximum wind speeds lowering to below level 6. Affected by the storm and a cold snap moving slowly from the North, from early morning of November 4, waters off coastal provinces from Quang Binh to Quang Ngai will face strong winds with gusts upto level 8 to 9, while provinces from Quang Tri to Binh Dinh and northern highlands will have heavy rainfall from evening of November 4. According to the Central and Central Highland Steering Committee for Flood and Storm Prevention and Control, all boats have navigated out of danger zones or returned to shore safely. Until now, nearly 1,000 boats have docked at Tho Quang Lock and Man Quang Bay. Currently, coastguards of Da Nang City have been instructing fishermen to dock their boats safely to prevent them from clashing into each other when the storm enters the mainland. They also have been patrolling regularly to prevent boats from heading out to open sea in such severe weather. On November 3, Thua Thien Hue Province announced that Huong Dien, Binh Dien and A Luoi Hydro Power Plants have started to release water at 50-100 cubic meters per second to ensure safety for the dam and the lower regions, when Storm ‘Krosa’ makes landfall accompanied with heavy rain.